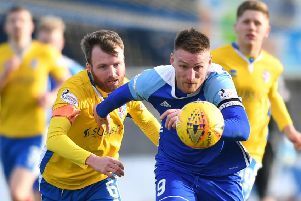 A point in an uninspiring draw was boosted by a penalty shoot out bonus point for Peterhead to get their campaign off to sound start. As most teams are finding when playing their first game in a competitive competition before the World Cup Final had even taken place and Wimbledon was still in progress, match sharpness and fitness are a long way off and that led to a tie full of effort but lacking in any kind of quality. The first half was dominated by Brechin who were to rue missed chances again reflecting the lack of match practice that they will need to put right if they are to bounce back from a horrific Championship experience last season that saw them relegated with no wins and a meagre four points. After just two minutes they earned a free kick 20 yards out for a foul Callum Tapping who took the responsibility himself and he whipped the ball over the wall with visiting keeper Greg Fleming taking no chances and punching ball away. There was a flicker of a half chance from Peterhead in the 10 th minute as Rory McAllister, who was to have a largely frustrating day, made his way into the penalty area in a central position but a perfectly timed tackle by Jordan Tapping took the ball cleanly. After 18 minutes it was Callum Tapping who threatened again, this time weaving his way into the left side of the penalty area before wastefully dragging his shot wide of the far post. Three minutes later a rare Peterhead attack saw McAllister earn a corner but Willie Gibson’s delivery was headed on by Jason Brown and out by Ross Kavanagh. Just short of the half hour a Dene Shields header was from a corner kick was saved by Fleming at the near post then the ball broke back to him and this time his low drive was cleared off the line by Jamie Stevenson. As the half time whistle approached, a Sean Burns free kick smacked off the visitor’s crossbar who were happy to regroup on level terms after a 45 minutes that they really should have been behind in. The second period saw a bit more desire from Peterhead and a result the fans were treated to a more end to end match with chances still at a premium. For the Blue Toon Aaron Norris squeezed a shot in from an angle but it was saved then new defender Cameron Eadie shot wide following a free kick. At the other end Italian striker Giuliano Morenahad a well struck shot blocked by Fleming before a Shields header was acrobatically tipped over by Fleming. Despite the action, a goal never quite looked like coming and the inevitable goalless draw and a point each was the outcome at the final whistle. But there was the potential for a bit of excitement as the penalty shoot with a bonus point up for grabs. McAllister, Jack Leitch, Russell McLean, Stevenson and Brown all converted for the Blue Toon with Gibson hitting the post for the only miss. For City, a Paul McLean a spot kick past the post and crucially Morena’s which was turned onto the bar by Fleming proved costly as it finished 5-4.